Whether you are a new athlete, competitive age grouper, or rising star, you’ll benefit from taking a mindful approach to endurance sports, using your training and racing to enhance your life. Sage Endurance can help you train wisely for events from the 5K to the ultramarathon, the charity ride to the century, the sprint triathlon to the full Ironman, in swim, bike, run, and every combination. In addition to my coaching certifications, my education includes a PhD in English. Literature gives us insight into the human condition, helping us answer the question of what to make of our existence. Yoga and endurance sports do the same. They teach us how to use our bodies and minds to make sense of our souls. I learn from my training and practice sessions every day. By paying disciplined attention to form and breath during your workouts, you’ll improve your sport performance, as well as your mental focus. I want to help your training and racing become a fulfilling part of your life experience—another way to build strength (in the form of sport skill, speed, and endurance), flexibility (the ability to maintain equanimity on hard days and through stressful situations), and balance (engagement in various healthy, wide-ranging, complementary activities). You’ll gain insight about what to make of your existence. My coaching is guided by three principles: balance, communication, and transparency. To paraphrase Finley Peter Dunne, the job of the coach is to comfort the afflicted and afflict the comfortable. In sport training, as in yoga, we need to play the edge, taking the body (and mind, and spirit) up to its limits to see what’s on the other side—to learn about our essence—but not to push so far that we do harm. This means that often my job is to hold the athlete back: to leave things out, rather than putting them in. Only through recovery do we receive the gains of training, so rest is essential for your physical and mental balance. You have to take it easy to be able to go hard. I love to talk about multisport training and racing. My coaching clients like to talk, too; it’s not unusual to share a number of e-mails in a single day, and I like to check in with my athletes during periodic workouts together. Why are you doing what you’re doing? Every workout should have a clear purpose. If you don’t know what you’re getting in a workout—how it should feel, why it is scheduled—you’re wasting your time and money. This fits into the bigger picture, too: you need a sense of what your training, racing, and sport bring to your life and to your world. We work together to connect your mind, body, and soul with something bigger. I have a small—and fast—clientele of competitive age groupers who compete in multisport events including triathlon and duathlon, as well as running and ultrarunning. I like to think of my coaching as boutique: I provide highly personalized service to a select group of discerning customers! 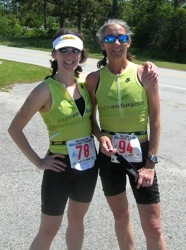 My clients’ goal races have included the Boston Marathon, the Marine Corps Marathon, the Massanutten 100-mile trail race, Ironman South Africa, numerous Ironman 70.3 races, and both short- and long-course World Duathlon Championships, as well as regional triathlons, running races, and adventure events. My athletes’ objective successes include numerous overall and age-group wins, qualifications for world teams, and Boston qualifications. Their subjective successes are much more important, as watching their pleasure in a race well run is a highlight of my career!